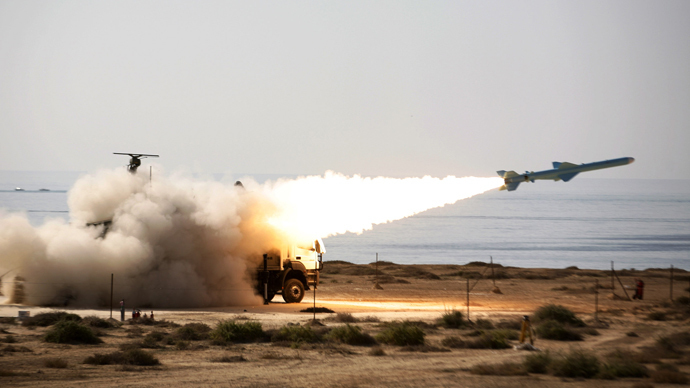 The Iranian armed forces have held military drills in the central province of Isfahan, in which they test-fired missiles and shot down mock-enemy drones over the Arak nuclear facilities. Part of the exercise was to train for unpredictable scenarios. The war games were codenamed 'Beit-ul-Muqaddas 27' and held in a desert area in Kashan County, the IRNA news agency reported Saturday, citing the Army Ground Forces commander, Brigadier General Reza Pourdastan. He proclaimed firing on Thursday of the Fajar, M6 and M10 missiles a success. Many units are taking part, including the infantry, armored and artillery units, and air support, as well as rapid reaction and elite teams. As part of the drills, Iran tested new domestic-made sniper rifles and military vehicles. The drills, lasting from May 21-27 are intended to test the training and readiness for emergencies among the armed forces. The games are to have two more phases, which will be carried out elsewhere in the country, with the final stage to take place in the city of Isfahan, according to Pourdastan. There has been a push by Iran to up its game militarily, and the new exercises are seen as a part of that. Iran is currently involved in a regional battle of words with Sunni rival Saudi Arabia, while those fighting in Yemen and other places have turned them into a front for a proxy war between the two. Iranian officials, including Supreme Leader Ayatollah Ali Khamenei, have warned the Saudis over exerting their geopolitical influence, including in their leadership of the airstrikes campaign that has been devastating Yemen. “Yemen, Bahrain and Palestine are oppressed, and we protect oppressed people as much as we can,” Khamenei said during a meeting with Iranian officials and diplomats from Muslim states. “Security in the Persian Gulf is in the interests of everyone... If it is insecure, it will be insecure for all,” Khamenei said in comments a week ago. Although the Islamic Republic continues to insist that any strides it has made in recent years, including nuclear enrichment, are meant as a deterrent, outside pressure has been mounting. A deadline looms for the six powers taking part in the ongoing Iran talks to reach a solution on its nuclear program. In the midst of that, Israel has recently angered Tehran with alleged threats of nuclear strikes, which led to the latter going to the UN Security Council with a complaint. Gholam Ali Khoshrou, Iranian Ambassador to the United Nations, urged the UNSC to condemn the "irresponsible remarks" made by Moshe Ya'alon earlier this month in Jerusalem. Earlier in April, Iran spoke on behalf of the 120-nation Non-Aligned Movement, insisting that Israel give up its “nuclear weapons” in support of a nuclear-free Middle East. Israel has not signed up to the nuclear Non-Proliferation Treaty (NPT), though it has sent an observer to the month-long conference for the first time in 20 years. Meanwhile, Washington blocked the final document at the UN conference dedicated to reviewing the treaty on Friday. The 9th international conference was held in New York from April 27 until May 22. A total of 162 Nuclear Non-Proliferation Treaty (NPT) participant states were in attendance. Some countries, including Egypt (who first proposed the nuclear-free zone in 1980) also proposed that a meeting be held with or without Israel – which is believed to have the Middle East’s only nuclear-capable arsenal.